Candidates will answer questions from the Chamber's Legislative Committee. If time permits, the audience may ask additional questions. Midlothian Chamber Candidate Forums allow a nonpartisan, unbiased, and impartial format. 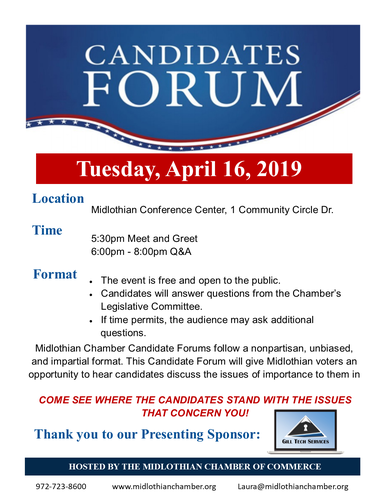 This Candidate Forum will give Midlothian voters an opportunity to hear candidates and discuss the issues of importance to them in this election. Come see where the candidates stand with the issues that concern you!